Review: That cover is just breathtaking isn't it? 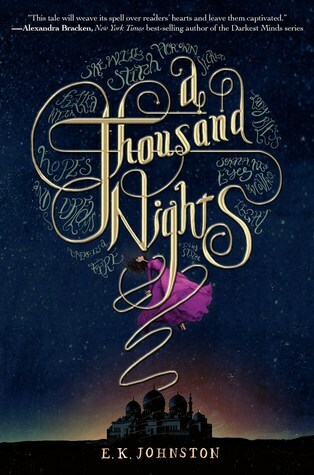 I love re-tellings it's always fun to see how someone interprets a classic and makes it their own and the writing for A Thousand Nights was beautiful. I felt like I was sitting around a story-teller and they were telling me about a tale of a brave girl who sacrificed herself because of the love she had for her family. I've seen a lot of people comparing this to The Wrath of Dawn, but I personally haven't read that book yet so I really can't compare the two. A few things that had me knock down a couple of stars for the book was the lack of names and romance. Besides Lo-Melkhiin, we don't know anyone's name, including the main character. Everyone was referred to as Sister, Sisters-Mother, Father's Father's Father etc and it all became a little annoying since it was a mouthful to say on repeat. The only name we knew was Lo-Melkhiin. As for the romance I expected a little something, maybe a point of view of the actual Lo-Melkhiin that was trapped with the demon and him falling for his bride, the anguish and sadness he must be dealing with...something. I did like the protagonist because of what she did for her sister without even thinking twice about it, along with how even after being taken by the demon king and being stuck in the qasr away from her family and not knowing when death will come for her she thought about protecting the women in the qasr from the evil that was within Lo-Melkhiin. She didn't care about her own death all she cared to do no matter where she went was protect the innocent and I couldn't help but admire her for that. 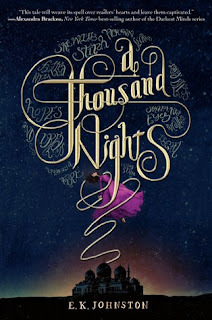 Overall A Thousand Nights is a magical tale about a magical girl who fights for the ones she loves all while trying to save her kingdom from the evil demon king. If romance is important to you then this isn't for you or if you feel the no-name thing will bug you I suggest stay clear of this one otherwise give it a try.